Mana Contemporary invites you to join us at the Keating Foundry for a night of art, wine, music, and a pig roast. Keating Foundry owner Ben Keating is a master sculptor who works primarily in bronze. He has also casted bronze sculptures for artists like Julian Schnabel, Michele Oka Doner, Kiki Smith, Tom Otterness, and many others. 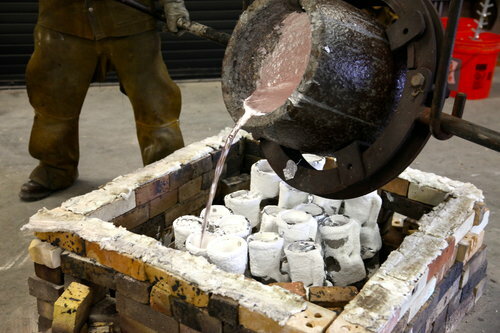 Visitors are invited to observe the age-old process of lost-wax casting, where a wax model of an object is placed inside a metal flask covered in plaster investment and fired; the wax is obliterated in the kiln, leaving behind plaster that is filled with molten metal. We will taste wine selections—curated by Mana Wine Director Marla Priest—from CoolVines, Di Giovanni, and Aidil Portfolio. To complement our selections, Crave Events Group has prepared a pig roast and BBQ-style menu. There will be live music by the blues-rock group P. Everett, who went from recording in a bedroom to touring with a five-piece crystal-garage band with musicians Jim Mellish, Arthur Kapp, Shawn Carney, and Bruno Smith. Their albums Roomy Tombs, Fantasies, and Saints of Disaster are available on their website, and on popular streaming platforms. Mana Wine classes and events are for novices and experts alike. Build your personal taste, learn about new regions and varietals, and demystify the art of drinking wine. Sign up here to stay updated about upcoming events!